It takes a special bride to wear a color other than white on her wedding day. You have to have a bold personality, and be willing to shrug off those who might gasp at something so different. Gwen Stefani wore a Christian Dior white gown with pink accents during her wedding with Gavin Rossdale in 2002. Once you choose the color of your dress, you can coordinate the color scheme of your entire wedding to match. Things like centerpieces, wedding favors, table cloths, and chair covers can all be matched to your color of choice to make your wedding day come together beautifully. 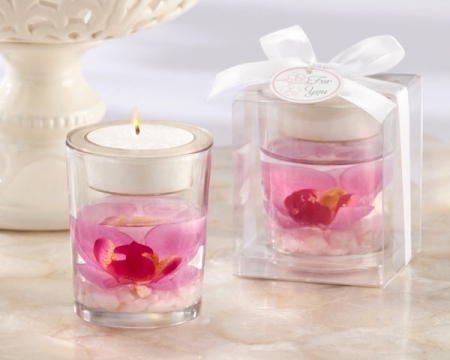 These "Elegant Orchid" Tealight Holders would make an elegant addition to a pink themed wedding. As long as you are truly happy with your color choice and you feel beautiful in the gown, that is all that really matters. So go for it! Try something different, and stand out on your wedding day.